There will be TWO PRESENTATIONS again this year (2018), Wednesday, December 19, and Thursday, December 20. This family-friendly, non-denominational event celebrates the return of the sun, weaving stories and songs together for a night that ranges from meditative to raucous … all of it deeply powerful and joyous. It’s more than a performance, it’s more than a worship service. It’s a feast of sound and spirit. If you’ve never attended, let us tell you a little about the event. Oh, and we can’t forget the fun feast afterwards. Everyone pitches in for the feast, bringing delicious finger food to share while connecting with other attendees. In 2010 the solstice team began performing the ritual at the Indiana Women’s Prison. This important ministry provided a critically needed religious alternative. Our performances there builds bridges to incarcerated Christian women who have sought conversation–in and outside the prison–in order to better understand the value of religious plurality. 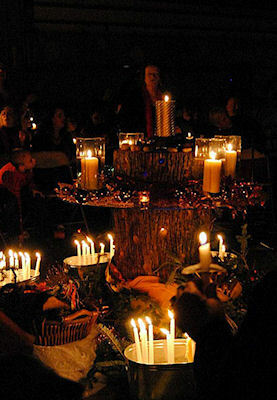 In 2004, Pam Blevins Hinkle stumbled upon a beautifully written ritual written by Julie Forrest Middleton, a Unitarian Universalist, and Stasa Morgan Appel, a self-described Quaker witch. These two women masterfully crafted a non-denominational and earth-affirming celebration that combines music and storytelling to mark the longest night of the year and the return of Sun. 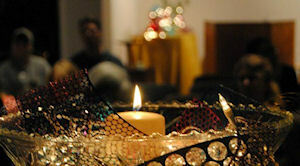 The Worship Associates at the Unitarian Universalist Church of Indianapolis (UUI), under the leadership of Rev. Edward Harris, agreed to sponsor and host the event under Pam’s leadership. In that first year, participants included members of UUI, the Indianapolis Women’s Chorus, the Covenant of UU Pagans, and others from diverse segments of the community. The event opened to a packed house of 400 people of all ages and religious persuasions, and has been standing-room only ever since. In 2012, the event moved to a new location, and expanded the circle of sponsors to include more local congregations and earth-affirming organizations. In 2013 the organizers took a year off. In 2014 the ritual returned to UUI, and remains there to this day.